The multi-talented Madeleine Allakariallak will serve as the next host of Igalaaq, CBC North’s longstanding Inuit language TV newscast, CBC announced March 17. Allakariallak will succeed the veteran Inuit language broadcaster, Rassi Nashalik, who will retire from the job this month after having hosted the show since 1995. Allakariallak become well-known across northern Canada in the 1990s for her recordings with the group Tudjaat, which she formed with cousin Phoebe Atagotaaluk of Inukjuak. In 1997, she started work at CBC radio in Iqaluit, first as a reporter and then as host the weekday morning show Qulliq for six years. In 1999, she won a competition that sought a song celebrating the creation of Nunavut on April 1, 1999. Between 2005 and 2007, she moved to Winnipeg to work for the Aboriginal Peoples Television Network, where she hosted and produced their nightly newscast and a weekly newsmagazine program. 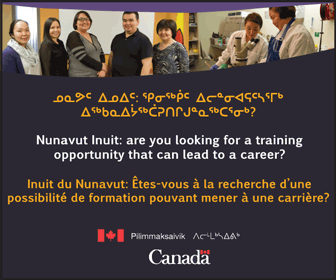 After that, she worked at Nunavut Tunngavik Inc. and, most recently, as executive assistant to Eva Aariak, the former Nunavut premier. “I am excited and eager to re-join the CBC North team after a 10 year absence. 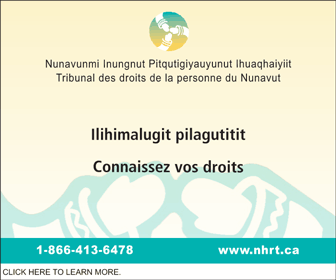 Inuktitut programming is extremely important to our community. I am honored to be the new face of Igalaaq,” Allakariallak said in a CBC North news release. Produced in Yellowknife right now, Igalaaq normally runs every weekday evening at 7:30 p.m. eastern and 5:30 p.m. mountain time. Allakariallak’s on-air debut is scheduled for March 31, CBC said. CBC North also said they are now “examining opportunities” for moving the production of Igalaaq from Yellowknife to Iqaluit.